CB Live Dazzles at Desert Ridge - Yay Baby! Desert Ridge is my stomping ground! We shop, eat, and play there pretty much weekly. 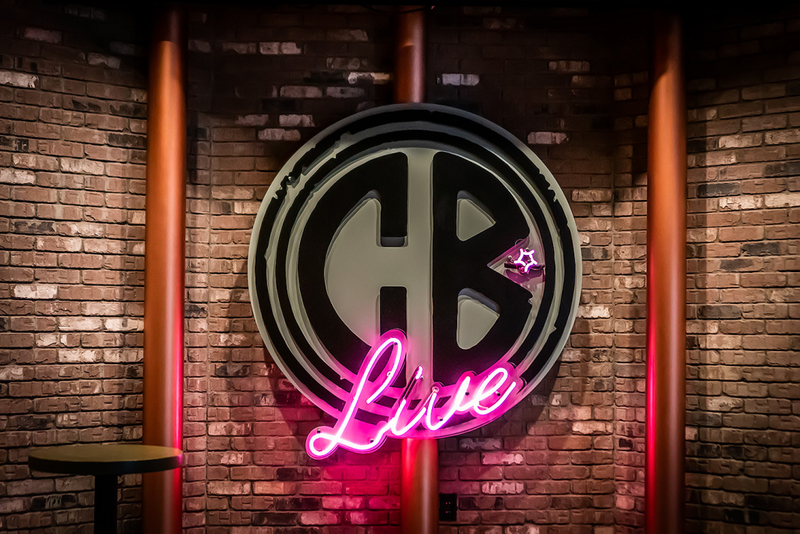 So I am beyond thrilled with the recent opening of CB Live, a multi-use comedy, music and entertainment venue with epic food and strong drinks! 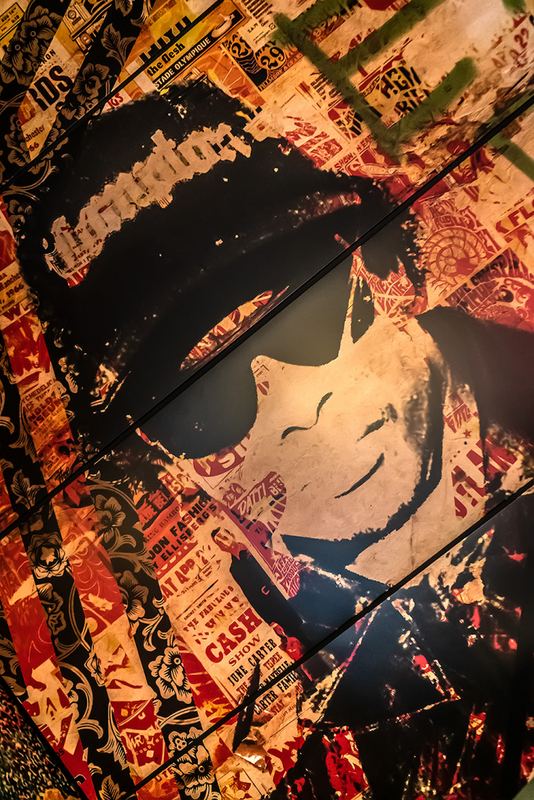 I was dazzled upon entry, the space is vast and open with pop culture icons looming tall on the walls. It’s very visually stimulating. In the center of the main room is the bar crowned with a stage for nightly live acts. A retractable, soundproof sky wall separates the comedy club from the main area. I visited for lunch and now I am itching to get back for some shows! But for now, let’s talk about the food. Entertainment venues are not always known for having great food when it’s the entertainment that is the main draw. 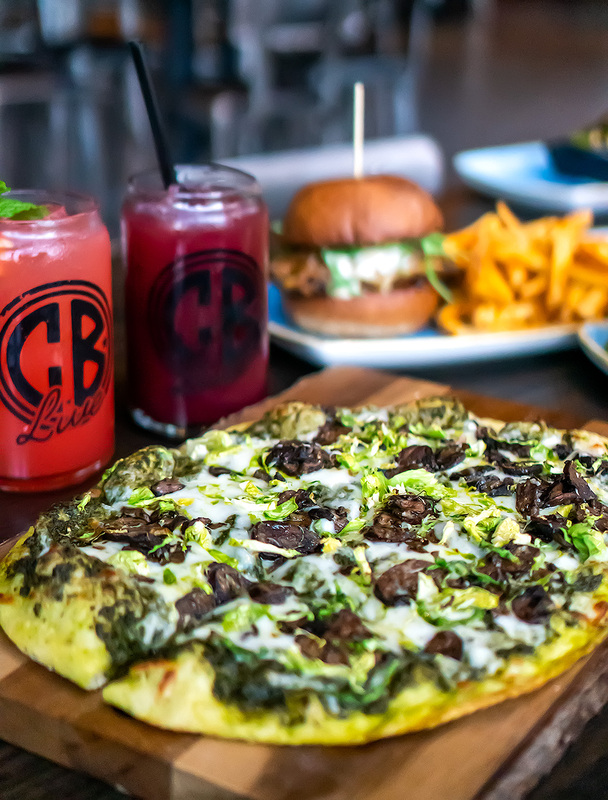 But CB Live has broken that stigma and offers an extensive menu with really great food. 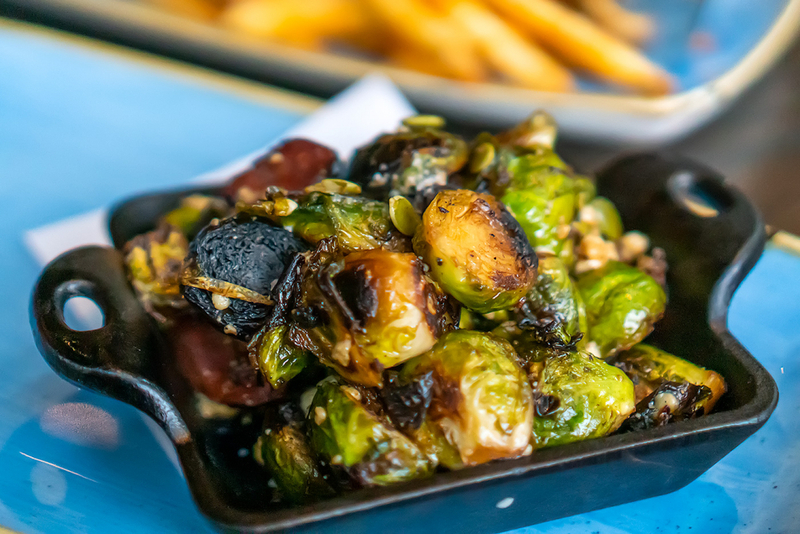 I love, love, LOVE Brussels Sprouts and I am obsessed with the ones at CB Live. OMG! They are BS perfection, charred and flavorful speckled with Chistorra sausage, pepitas, cotija cheese and lemon juice. The sausage was a hearty addition that offered a warm spice, the pumpkin seeds added great texture and the spritz of lemon juice woke the dish up with an acidic punch. 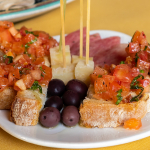 You can even add chicken, steak or salmon to make this appetizer a protein-packed meal. Totally awesome. 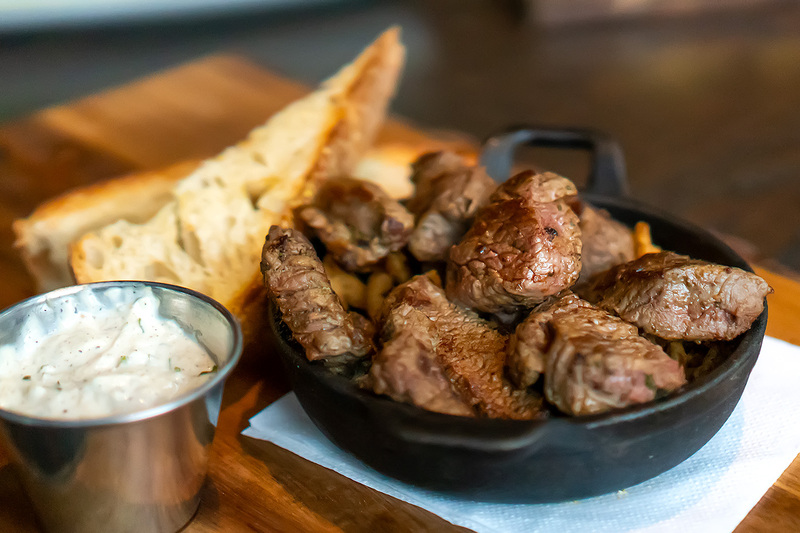 Another hearty appetizer option are the Steak Bites served in a skillet with crispy onion strings, toasted ciabatta slices and a creamy horseradish. The steak was expertly cook to medium; tender, juicy and simply seasoned with salt and pepper, letting the meaty flavors shine. Make little steak sandwiches piling on the onion strings and slathering the ciabatta with the horseradish sauce. — yum! You’ll find yourself battling it out for the last bite. I was indecisive during my visit so I ordered two entrees – the Pesto Mushroom Pizza and the Grilled Chicken Sandwich. The pizza was on pointe. 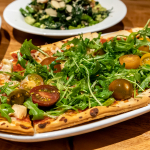 A tender thin crust sauced with almond pesto and topped with portobello mushrooms, shaved brussels sprouts and cheese. The pesto was light and not overpowering, the mushrooms were meaty and the addition of brussels sprouts was most welcomed! It was a great pie, generous too, so perfect for sharing. The Grilled Chicken Sandwich was great too. I loved the seasoned char on the chicken, which was nice and juicy. The adornments sent this sandwich over the top, sweet caramelized onions, sharp white cheddar and bacon jam! WOW, what a sandwich. And as great as the sandwich was I could not get enough of the fries that came with it. Here it is…I am going on record with this…CB Live serves the BEST FRIES EVER!!!! Ever! I am a fry snob. I like them perfectly crispy, not too thin, not too thick, seasoning has to be right and the fries must be hot! Oh, my these fries killed it on all points. They are medium thickness, wonderfully crispy and seasoned by the French fry gods themselves. 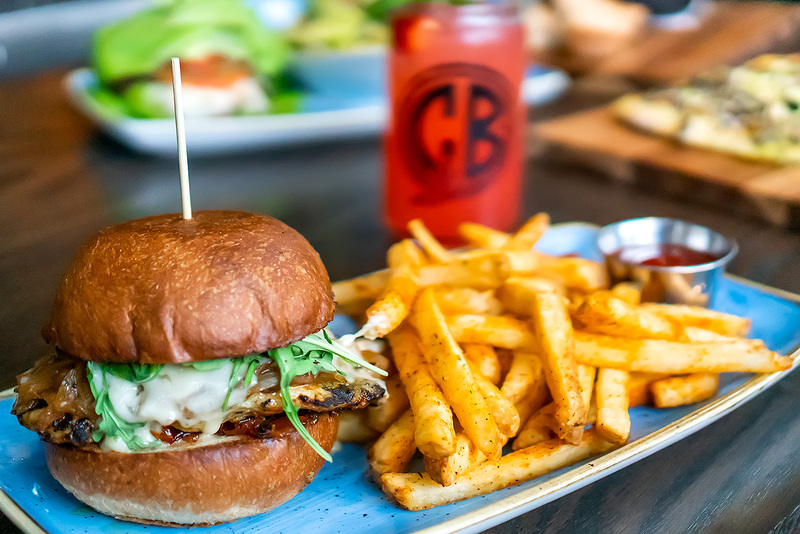 If eating light is your jam, CB Live will take care of you. They offer a few different salads or you can go bun-less with the Copper Burger, like my friend did. 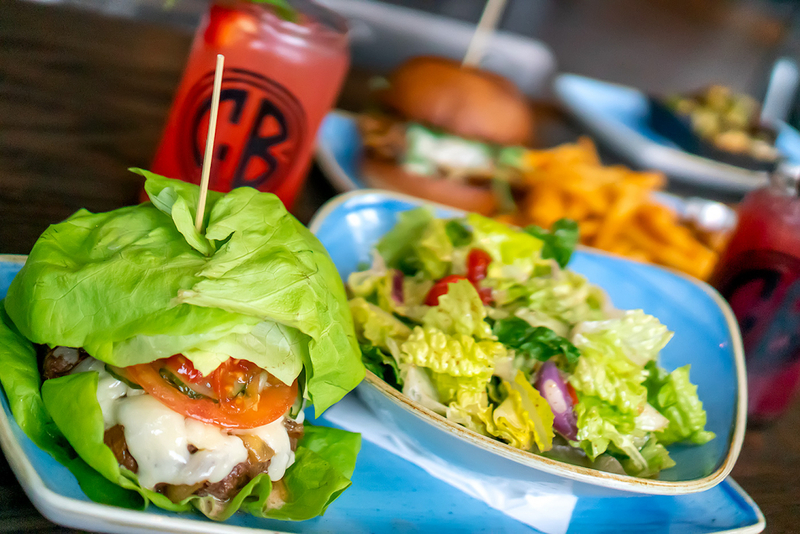 That was one juicy burger, wrapped in bright green lettuce leaves and dressed to kill in cheddar cheese, lettuce, tomato caramelized onion and Copper sauce (FYI – it usually comes on a soft brioche bun). My friend opted for a side salad but winded up eating half my fries!! 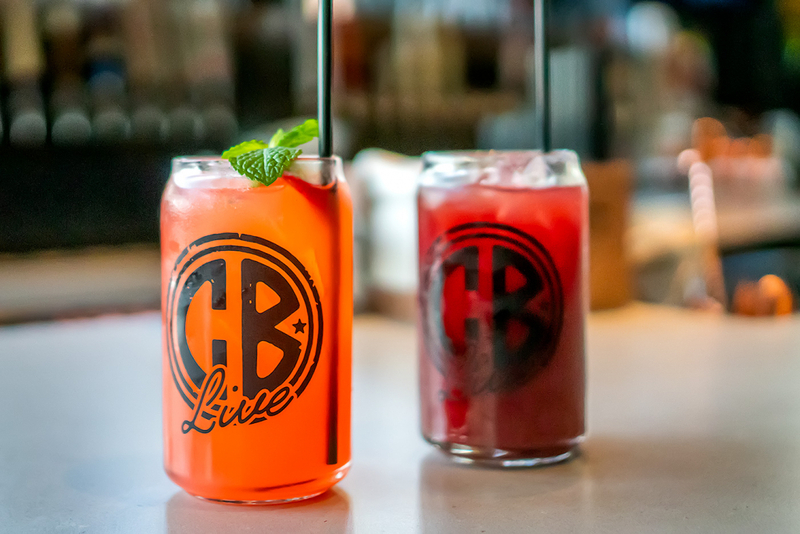 CB Live isn’t messing around at the bar either, their cocktails are potent – beware. We ordered the Strawberry Fields, a strong concoction of Ketel One Vodka, house-made strawberry candy cordial, Violette, and fresh-squeezed lemon. It’s slightly sweet and pretty powerful, a warm buzz that will creep up on you. Perfect for an evening of music and laughs. I also enjoyed the Maria Maria, a seasonal sangria made with Arizona red wine, seasonal fruits and a lot of St. George Brandy. It was probably one of the tastiest and strongest sangrias I have ever had. Kudos to the heavy-handed bartenders who know how to ensure their patron’s have a great time, which is pretty much inevitable at CB Live, with or without cocktails. I am giddy for the excitement CB Live will bring to Desert Ridge and the entire north valley! Live music, comedians and variety acts. Their schedule is already packed with some pretty big name headliners. Check out the schedule here. I know I’ll be back soon and frequently, even if only for those fries!! 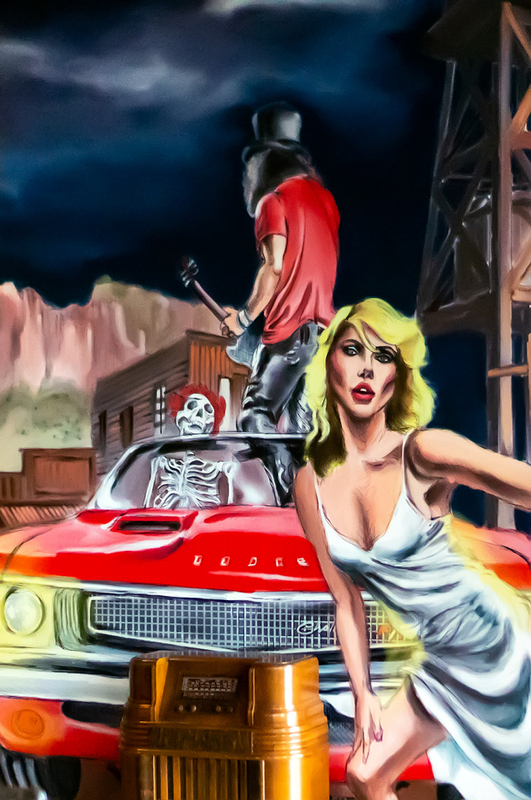 CB Live is located at 21001 N. Tatum Blvd., near Barnes & Noble in The District at Desert Ridge Marketplace. 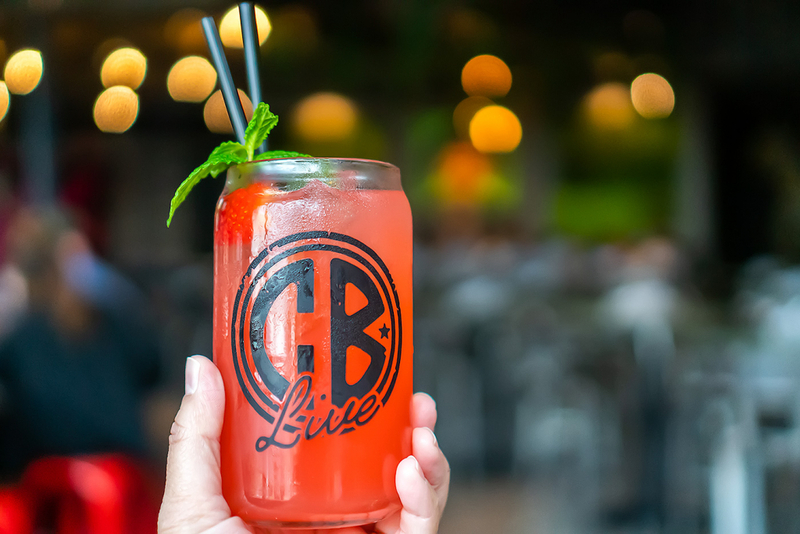 Disclaimer: I enjoyed a meal at CB Live free of charge to help facilitate this post. As usual all opinions are entirely my own.